As a chilling report published in the journal Clinical & Infectious Diseases notes, there has been a simultaneous emergence of Candida auris on different continents with the same genetic profile, which suggests it didn’t emanate from a single source and then spread. A retrospective investigation finds a case of Candida auris was reported in 1996 and another in 2008 before the so-called first reported case in 2009. We can accurately presume it’s been killing off hospital patients for some time now. Public health authorities are sworn to secrecy. A report published in the New York Times notes that hospitals and local governments are reluctant to disclose outbreaks for fear of being seen as infection hubs. The CDC under its agreement with States, is not allowed to make public the location or name of hospitals involved in outbreaks. A public health contradiction is deadly cases of food poisoning in a restaurant certainly make news headlines but if deaths occur in a hospital due to drug-resistant infections, it is not disclosed. The public be damned. And while this monster yeast has yet to spread outside hospitals, it certainly poses a threat to those who are immune compromised – diabetics, malnourished (in particular zinc deficient individuals), those individuals who take immune suppressant drugs, and the very young (under 5 years of age) and the very old, whose immune systems typically aren’t up to par. “The most worrying ‘superbug’ on the CDC’s radar…”. – Chief of Mycotic Diseases, CDC. It survives despite all the hospital disinfection strategies to destroy it. Gowns, gloves, disinfectants, bleach have all failed. The longer the hospital stay the greater the chance of infection. Patients with breathing tubes, urinary catheters, intravenous tubes, are at greatest risk. More than 90% of Candida auris infections are resistant to one drug and another 30% resistant to two or more drugs. In general, Candida auris is uniformly non-susceptible to fluconazole (which is front-line drug treatment), which has also been reported previously in Asia, Europe, South Africa, South America and North America. “The last-resort drug, amphotericin, is so toxic, it’s severe fever-and-chills have been dubbed “shake and bake.” Doctors avoid amphotericin whenever possible. Will it spread beyond hospitals: yes or no? Journalist Susan Matthews writing at Slate.com says the public doesn’t need to worry about the new drug-resistant super fungus. “The fungus is a very legitimate public health issue, but for almost everyone in the world,” she says, “it will not be a personal health issue.” Matthews notes that the fungal outbreak is more likely to be hyped to demand greater funding for research than it is to protect the public at large. While there may be some truth to that, to the contrary, Dr. Bruce Y. Lee, Associate Professor of International Health at the Johns Hopkins Bloomberg School of Public Health, writing at Forbes.com, says “don’t take Candida lightly.” He says: “It can invade your body and kill you if your immune system is weakened.” This fungus doesn’t know where hospital walls start and stop. Screening efforts found 453 people had the yeast on their body but were not ill. This “fungus that is among us” is ubiquitous. It’s not the fungus, it is a compromised immune system that is allowing this fungus to kill. Modern medicine is paying a steep price for its over-reliance upon (failed) drugs rather than a strategy to elevate immune defenses. “Unless more effective new medicines are developed and unnecessary use of antimicrobial drugs is sharply curbed, risk will spread to healthier populations.” Scientists predict millions could die, eclipsing the number who die of cancer! A recent report published in the journal PLoS Pathogens entitled “Candida auris: An Emerging Pathogen ‘Incognito’” states: “Candida auris… carries an astonishingly high mortality rate.” Whereas most candida infections arise from the patient’s own gastrointestinal tract, this one spreads rapidly among patients, and it is efficiently transmitted from person-to-person. A nightmare no one wants to hear. Another observation is that candida infections usually arise as the immune response is compromised, as evidenced by neutropenia – a shortage of neutrophils, a type of white blood cell that is a first responder to infection of any kind. But this time it’s different. Infectious disease specialist Dr. Jeniel Nett at the University of Wisconsin School of Medicine notes that Candida auris is invasive despite the absence of neutropenia! Neutrophils usually kill fungi by a process called phagocytosis — the ingestion of fungi and other germs — and then disposes of these pathogens. About 50% fewer neutrophils are produced in response to Candida auris compared to Candida albicans, a more common form of candida infection. This fungus is actually turning off the immune response. Where in the world did it come from? In 2013 Dr. Jacques Meis, a microbiologist in the Netherlands, noted that itraconazole, an anti-fungal drug that is prescribed for another fungal infection (Aspergillus), is a molecular copy of azole pesticides and weed killers that are used to dust crops. Treatment-resistant Aspergillus infections began showing up where azole fungicides were being used. The CDC has been informed of this. A similar problem is occurring with the agricultural use of triazole fungicides in the eradication of Aspergillus, a fungus that poses a threat to crops. Anti-fungal resistance to triazole anti-fungals is now said to pose a threat to human health. Candida albicans is the most frequently isolated species in hospital settings. The companies that sell anti-fungals to the agriculture industry are in the know as to the geographical distribution of their products. Another common reason for drug resistance to all forms of bacteria and fungi is drug efflux. The drugs are shuttled out of the infected cells by internal pumps. Various natural molecules (carvacrol from oregano; thymol from thyme; cinnamaldehyde from cinnamon, lovage from Levisticum) potentially reverse drug resistance by inhibition of efflux (expulsion) of the drug from infected cells. But these natural remedies go unused. If everybody in America reads and heeds this report, there won’t be a bottle of zinc left on store shelves. Ditto for garlic. Zinc supplementation has been shown to exhibit beneficial effects on many pediatric illnesses. 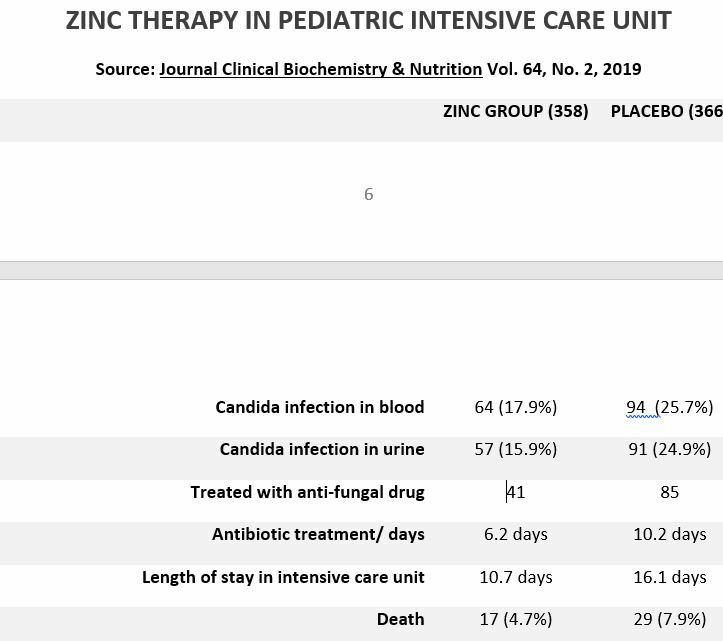 In a study of 724 children in a pediatric intensive care unit, patients were placed on zinc supplementation (20 mg) or given a placebo. 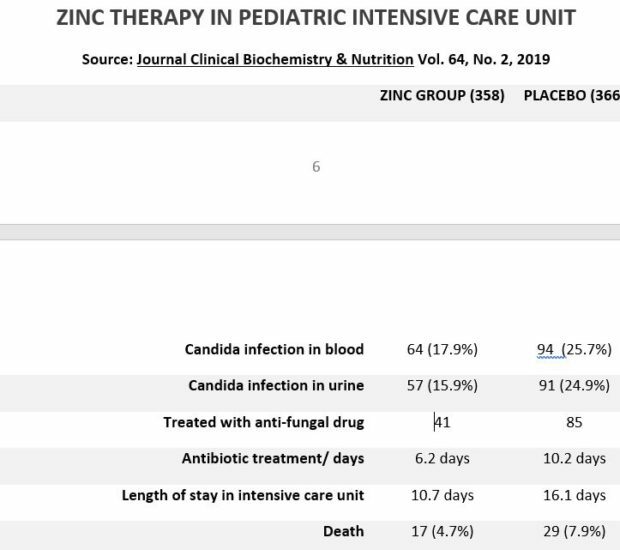 The existence of Candida in the blood and urine were lower in the group that received zinc and the death rate was reduce by 68%. Since 1996 it was reported that malnourished children experience a shrinkage (involution) of their thymus gland that converts white blood cells that originate in the bone marrow (B cells) to thymus cells (T cells). T-cells comprise a subpopulation of white blood cells that develop long-term antibodies to various germs. After one month of zinc therapy (2 mg) the size of the thymus gland normalized whereas children receiving nutrients without zinc took 2 months to recover normal thymus gland size. The duration of hospitalization was halved. It took over two decades for infectious disease investigators to revisit zinc therapy. At least since 1977-1978 it has been documented that zinc deficiency induces a shrinkage of the thymus gland and impairs the immune system (T cells). Zinc therapy increases the size of the thymus gland and infections associated with malnutrition. The severity of Candida infections appear to involve an environment where copper predominates over zinc. Allicin, the initially active principal in crushed garlic, is considered to be similar to that of fluconazole, the first-line drug used to treat Candida infections. Amphotericin B works better when combined with allicin. Amphotericin B + allicin induces serious damage to fungi. Both fluconazole and allicin exhibit a common mechanism — the suppression of the Sirtuin1 survival gene. Candida has the ability to grow into long filaments. Allicin down-regulates the Sirtuin1 survival gene (-5.54 fold) similar to fluconazole (-3.48) and is reported to inhibit the filamentary growth (hyphae) as well as fluconazole. Fresh garlic extract inhibits the growth of Candida albicans and has potential to improve the effect of antibiotics on antibiotic resistant pathogens. Candida fungus in a lab dish (left) and in lab dish withfresh-crushed garlic (right). Kill-zone is wider in garlic dish. 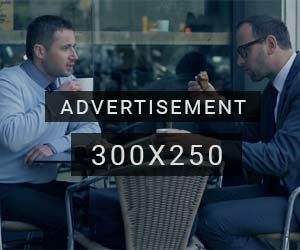 Most commercially sold garlic pills do not provide allicin, even the brands advertised to provide allicin. Allicin is produced when a clove of garlic is crushed to mix alliin with allinase, the activating enzyme. But hydrochloric acid in the stomach destroys the enzyme and no allicin is produced unless that garlic clove is crushed prior to ingestion and the enzyme is activated outside of an acid environment. The challenge then becomes how to swallow such a pungent bolus of crushed garlic. One alkalinized garlic capsule neutralizes the surrounding stomach acid and is proven to produce as much allicin as a fresh-crushed clove of garlic. Hospitals do no screening of newly admitted patients to determine their level of immunity. It is noteworthy that a third of patients not malnourished at the time of hospital admission become malnourished during their hospital stay. Then patients are thrust unto dark sun-less rooms where the main source of vitamin D, sunshine, is blocked. Low vitamin D blood levels are associated with infections. Vitamin D influences neutrophils, white blood cells that destroy funguses. Vitamin D deficiency may depress neutrophil responsiveness to funguses like Candida. Hospitals ignore the immune status of new patients upon admission, then allow these same patients to develop infections like Candida, for which doctors must then use anti-fungal drugs to rescue patients from the edge of death. When those drugs fail due to germ resistance, modern medicine has no fallback position. Patients are needlessly left to die. It is unclear why laboratory mice appear to control Candida auris, while human neutrophils fail to recognize and kill the pathogen. Unlike humans, most mammals like mice internally secrete their own vitamin C from their liver. In the animal kingdom, except for fruit bats, guinea pigs and primate monkeys, vitamin C is continually produced day and night, more so when under physical or mental stress. Vitamin C was once a human hormone. But a mutation in the GULO gene that halts production of an enzyme (gulonolactone oxidase), that in turn converts blood sugar to vitamin C, has forced humans to be totally reliant upon their diet for this essential vitamin. Vitamin C is reported to accumulate neutrophils. A deficiency of vitamin C renders a person vulnerable to infection via neutropenia (lack of neutrophils). Does the fact mice endogenously produce vitamin C while humans do not explain why laboratory mice control Candida auris? While vitamin C plays a key role in neutrophil activation and in trapping neutrophils to facilitate the death of pathogens like Candida, 0ver-activation of neutrophils may result in tissue and organ injury. Vitamin C prevents this overactivation. This protection may be critical to survive Candida infections. Amphotericin B, a last-resort drug to treat Candida infections, is administered intravenously. Of interest, it is reported that the survival rate of Candida-infected patients receiving Amphotericin B was less than 11% compared to 53% survival with Amphotericin B + intravenous vitamin C.
A new type of vitamin C pill that is said to reactivate a flawed gene to internally produce vitamin C on a 24/7 is now available. Of the first 22 people who have taken the pill, 22 have experienced round-the-clock elevated blood levels of vitamin C without reliance upon the diet or C supplements. This could be a game changer for humanity. Selenium, an essential trace mineral, also activates neutrophils and has been documented to do so in humans. The public must read between the lines of reports emanating from news bureaus and public health agencies. Candida auris has been in existence for years now. Deaths have either been hidden from tabulation because of misidentification of the fungus, or from frank coverups within the industry itself. If an outbreak of Candida auris should occur, there would not be enough drugs to prevent or treat millions of patients on short notice. A panicked public would then be forced to reach for proven but ignored alternatives like zinc, garlic (allicin) and vitamins C and D.
Doctors didn’t go to medical school to prescribe garlic and vitamin pills. Hospital pharmacists hold their nose at these natural remedies. So, don’t run to doctors to obtain their approval. Make sure your immune system is up to par with the every-day use of these herbal and vitamin supplements. Stock up on these remedies before panic begins. Remember, whatever you are reading or hearing about Candida auris, you are not getting the whole story which is being kept under wraps. Don’t let Candida auris sneak up on you or your family because you mistakenly relied upon the Centers For Disease Control for your information. The consequences could be grave. The post Hidden Epidemic appeared first on LewRockwell.